Government Debt Management at the Zero Lower Bound is a very nice and interesting paper by Robin Greenwood, Sam Hanson, Josh Rudolph, and Larry Summers. Figure 1. Comparing Quantitative Easing and Treasury Maturity Extension, 2007–2014 ...the cumulative change in 10-year equivalents (scaled as a percentage of GDP) associated with the respective balance sheet policies undertaken by the Federal Reserve and the Treasury. Positive values increase the interest rate risk placed in public hands (Treasury policies), while negative values decrease it (typically Fed QE, but also Treasury maturity shortening in 2008–2009). First point, what the Fed taketh away, the Treasury giveth. (Hence the title of this post). The Fed bought lots of long-term debt, with the idea that this would raise the price, lower the interest rate on the long-term debt, and thus stimulate the economy. At the same time, however, the Treasury was selling lots of long-term debt. Interest rates are very low, and debts are high, so it's a great time to lock in low-rate financing. Homeowners and businesses are doing the same thing. Alas, the Treasury and Fed are part of one budget constraint, so you can't have it both ways. As it turns out, the Treasury sold even more than the Fed bought, so by their calculations, during the period of QE, the private sector absorbed more long-term government debt! ...despite successive rounds of QE, the stock of government debt with a maturity over 5 years that is held by the public (excluding the Fed’s holdings) has risen from 8 percent of GDP at the end of 2007 to 15 percent at the middle of 2014. Said differently, the volume of 10-year duration equivalent debt has doubled from 13 percent of GDP to 26 percent of GDP over the same interval. Pressure to absorb long-term government debt has actually increased rather than decreased over the last six years! The closing section, and main point, I think, is a proposal for how Fed and Treasury should divide responsibility to avoid such loggerheads. I might add that event studies around announcements of future purchases tell us what the market thinks the effect of those purchases will be. Rational expectations is not a solid guide to events outside of all historical experience. They argue for a much shorter maturity structure overall, trading the liquidity and low interest rate benefits of issuing short term debt against the insurance against interest rate rises benefits of issuing longer debt. Here's the simulation. They compare surplus/deficit and total debt under existing debt and what would have happened if the Treasury issued only 3 month bills. You can see with 3 month bills that interest-induced changes in deficits come sooner. But there isn't a big difference. From this they conclude that the interest-rate-insurance that comes from long term debt isn't a big deal. The US maturity structure is quite short. Last time I put together the numbers, the US rolls over half our debt every two years. And historically, it's been much shorter. So shortening down to three months doesn't change things a lot. How would lengthening to perpetuities work here? The danger is a large debt to GDP ratio and the risk of a rate rise. Now we have $18 trillion of debt, so interest rates rising to 4% means $760 billion more deficits. The graphs show two important data points really. At the end of WWII we had big debt/DGP. And interest rates stayed low until the 1970s. At the end of the 1980s, we had a big rise in real rates. And a low debt/GDP ratio. So, Russian roulette, the gun clicked twice, doesn't mean we're safe. This isn't about averages, it's about risk management. Still, it's a challenging calculation, and to answer it properly requires a simulation of possible interest rate paths and debt stocks. They opine on real vs. nominal debt, too, arguing for more nominal debt, and much else. The whole thing is a good read. 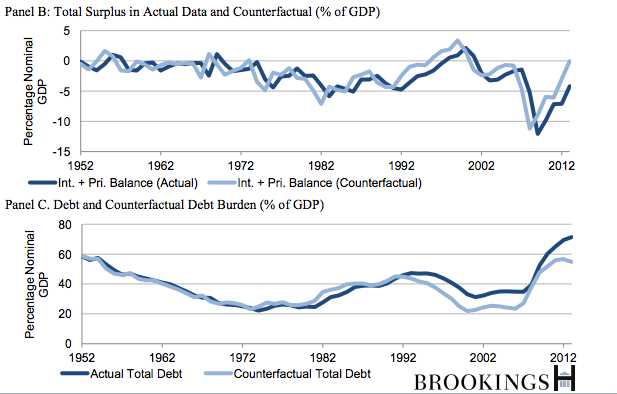 "Figure 8 Debt and Deficits under Counterfactual Debt Management Plans. The counterfactual exercise measures the path of deficits and debt supposing that the U.S. Treasury had financed itself using rolling 3-month Treasury bills starting in 1952." One thing that is missing from the counterfactual is a comparison of yearly interest payments and annual tax revenue. Sure the federal government can issue all 3 month bonds and then go Ponzi by making the interest payments through additional bond sales. The federal government even during World War II has NEVER attempted Ponzi finance. 1. Actually a lot of federal debt is owned by federal agencies. The actual federal debt outstanding is about $13 trillion not $18 trillion. 2. Sellers of Treasuries to the central bank (the Federal Reserve Board) would have to do something else with their (freshly created) money, such as spend it, invest in other assets or put it in the bank. The latter might not be stimulative, if banks then do not lend out their reserves. However, the central bank always has an option to conduct even higher levels of QE and force feed money into spending or investments in equities and property. I think this is why QE worked for the U.S. It justshould have been more aggressive and larger. As for fish and signaling I wonder if that is something dreamed up by economists. I worked for 20 years in the private sector and never heard anyone talk about Fed signals.